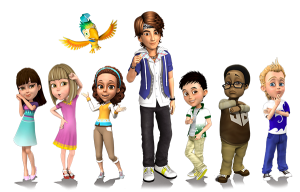 FLYING WITH BYRD is a CG-animated series designed to entertain and enlighten kids aged 6-11 throughout the world. The series features a cast of ethnically diverse tween-teen characters (12-13) – just slightly older than the series’ target audience – who have adventures as they travel around the world – as well as through time and space. Their mentor and guide is BYRD a handsome, international pop star who is on a quest to find all the “lost notes” floating through time and space and use them to compose the Universal Symphony of Harmony. The series is fun, upbeat, inspiring and casually educational (but NEVER preachy) – stressing themes of friendship, curiosity, teamwork and making the world a better and more peaceful place for all. And, of course, the series will help young viewers appreciate music!